Proposed mural “The Whaling Wall” by Knox Martin. 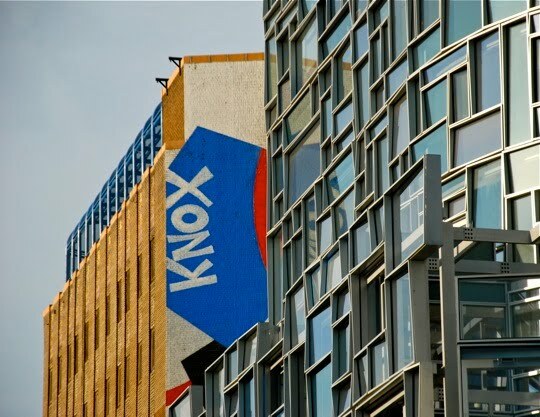 Octogenarian New York artist Knox Martin had his most recent gallery show last fall, and is apparently eager to get his work back out on the streets, especially after two of his distinctive post-Cubist murals have recently disappeared—one behind advertising, one behind condos. He’s planning a bloody anti-whaling painting (rendered above) for the Lower East Side. The piece, titled “The Whaling Wall,” portrays an underwater whale massacre in a vivid palette of red and blue. The primary paints will be provided by Golden Artists Colors and Woodward Gallery on Eldridge, which represents Martin, is coordinating the project. But the final push to provide scaffolding, rigging and the actual painting crew depends on donations, to which you’re more than welcome to contribute. If completed according to schedule later this month, the mural will be hard to miss on the upper floors of 334 Grand Street at the corner of Ludlow Street. In addition to Woodward Gallery overseeing the project, Martin’s environmentalist public artwork has earned the support of Greenpeace, the New Museum, Juxtapoz magazine and the Lower East Side Building Improvement District. Between this and Ai Weiwei’s “Zodiac Heads” (officially unveiled this morning), it’s turning into an exceptionally good month for sad public art. Wonderful! Looking forward to the Whaling Wall by Knox Martin! The Whaling Wall is a sponsored project of Fractured Atlas non-profit arts service organization. Contributions for the purpose of The Whaling Wall must be made payable to Fractured Atlas (501(c)(3) public charity) and are tax-deductible to the extent permitted by law.